The Xbox Live Arcade ensemble isn’t widely recognised for its contributions to the horror genre, but then again neither are 2D sidescrollers. But then its often the atypical and unfamiliar that proves the best offering and in that spirit Limbo is born; the sidescrolling puzzle-platformer from Danish indie developer Playdead Studios. The first thing to point out about Limbo is it’s very minimalist, in terms of design and narrative, in fact there’s virtually no story at all. The description on XBLA offers a rudimentary outline, but I advise you to skip reading this, as I inadvertently did, because it plays out slightly better when you’ve literally no clue to begin with. It’s also in the interest of letting Limbo speak for itself, as once you open the game, you’ll see they’ve deliberately omitted a prologue or introduction. So it starts out simple enough, with the player, waking up as a young boy in this dusky forest, painted in gray-scale, with only your avatar’s bright white eyes to distinguish him from his surroundings. Right from the beginning and from there on, queries and questions as to the context and events that occur will engulf your mind. Limbo has but two actions: grab and jump. Yet with these manipulations, Playdead have concocted some of the most brilliant puzzles I’ve seen in a 2D game, from simple to the highly complex. But I must qualify that description because every single puzzle is, in essence, bearing in mind the basic laws of physics, simply constructed; but that doesn’t necessarily make them easy. I spent an eternity trying to fathom many of the puzzles, including the very first one, but discovered that in each and every one, the answer lay in just thinking laterally and not trying to think like a game designer or jump the gun. 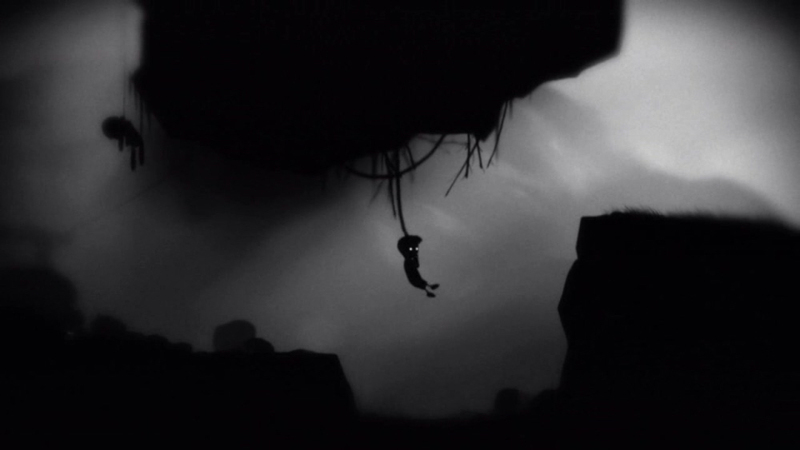 However, Limbo’s brilliance in puzzle design really shines through when you come to realise that the solutions, no matter how long it’s taken you to arrive at them, never seem frustrating or unfair and rarely involve looking for some object deceitfully hidden away – there’s almost always a logic to be followed. Thus the many inventive physics-based puzzles Limbo has to offer almost always grant a sense of accomplishment upon completion, as well as relief. One thing the player has to accept is that dying is a part of the world of Limbo, and dying gruesomely at that. There are a few parts that will almost undoubtedly end in your prompt dissection or crushing, but they’re like that for a reason, and are often a result of a misjudgement within the platforming aspect of the game. It’s not so much for trial and error, rather an emphasis of the dark world you’re trapped in. Playdead have though, managed to make sure the threat of death is terrifying and very much round every corner. [mild spoiler ahead: skip the rest of this paragraph if you want to be completely and utterly oblivious to your fate in the early sections of the game] Bear traps litter the opening puzzles and snap you up at a lightening-fast pace, if set off, and perhaps most notably testicle-retractingly petrifying, at least for me, was the giant spider, who blocks your path fairly early on and is able to skewer you with sinister precision. Equally, the world itself evidences its harshness with corpses and carcasses forebodingly cluttering your path, and occasionally becoming part of the solutions to your puzzles. Indisputably, Limbo’s world is savage and callous, but if that sort of thing puts you off, try turning the gore off or just give it a miss. 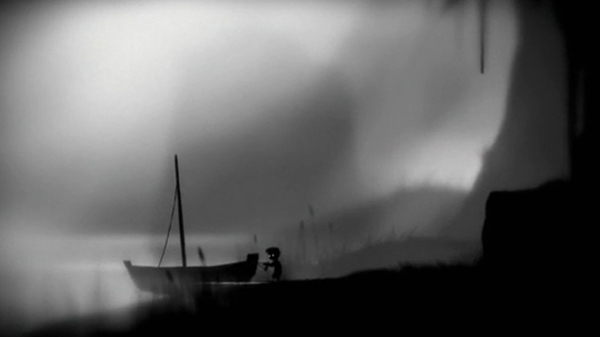 If there’s one word that comprehensively sums up the feel of Limbo, it’s atmospheric. The striking monochrome visuals set Limbo apart from not only other games, but from any semblance of dateability because there’s no way it could ever look or indeed need to look any better with higher graphical capability. The fact that you can often only place your character on the screen on account of his eyes establishes a grave sense of being irrevocably lost, and struggling for contact or companionship. The sound design also draws from the minimalist theme, sounding only your footsteps and the traps you come across. As you can well imagine, the marriage of this bleak aesthetic and choicely interrupted silence, masterfully creates a unique and deftly menacing world. Limbo is also excellently animated, perfectly mimicking the way in which a small boy would move along and dangle from ropes. As I mentioned earlier, the deaths are unrelentingly grisly, which is an impressive achievement given the very limited colour palette. The rag-doll nature of the body and its various parts do a great job at showcasing both internal organs and solid physics. The first half of the game purposefully begs many questions and presents some harrowing, frustrating (from the point of view of the character) and mysterious moments, shocking and scaring you, interweaving each scene with engaging gameplay, that has you on the precipice of death continually. Unfortunately, Limbo’s major flaw lies in its pacing, as the surprising little encounters that are dotted through the first half dissipate quickly into endless puzzles and little else. I suspect Playdead are trying represent the increasingly difficult struggle for our protagonist, but sadly and ironically, it begins to become a little colourless. This doesn’t, however, detract from the fun had from solving these puzzles. The great thing about Limbo is you can take it at any level you wish to; as creepy and captivating puzzle-platformer or as a shadowy tale of struggle and confusion. You can ponder over the context and as to why the boy is there, and attempt to extrapolate what you will, or take it for what it is. I noticed a number of reviewers complaining that there’s no big reveal or explanation, but there’s no dogma that dictates a game, or any book or movie for that matter, is obliged to expand upon and explain every detail. The unknown is where the intrigue is and leaves room for plenty of conversation, and it undeniably has got people talking. 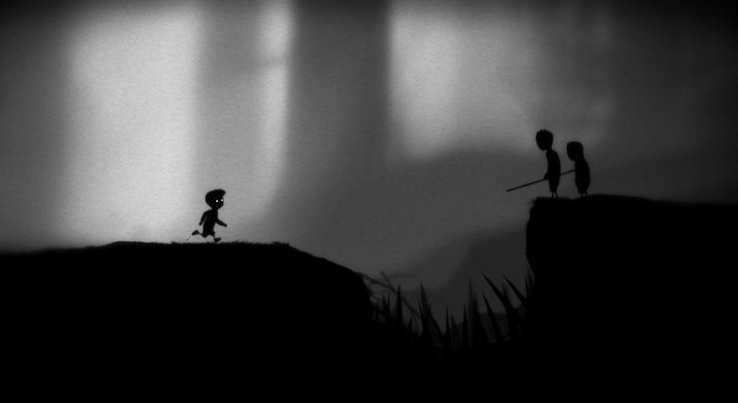 As far as games go, Limbo is definitely on the artsy side, but I implore you to not let it put you off. That label is often synonymous with pretentious and over-complicated which is not what Limbo needs to be, it’s enough to simply enjoy the experience. So call it artsy fartsy if you must, but any pretensions to some convoluted allegory are purely the result of player conjecture. [mild spoilers ahead: skip this paragraph to avoid fairly mild spoilers] There are certainly some interesting questions to be asked about the nature of the boy’s quest and his motives. On the surface, the spider is vicious and terrifying, yet you’re the one who’s attempting to get past it, pulling it limb from limb – at first it has no intentions of chasing you. Equally questionable is the moment when you run over to what appears to be another boy sitting, and inadvertently cave the floor in, causing the body to hang from a noose – there’s no indication if the boy was alive or not. Did you kill him? It’s a haunting thought. Limbo is a remarkable and unmistakably unique experience that clocks in at a modest 4 hours, perhaps less if you’re not mentally challenged by puzzles like yours truly, but costing 1200MS points and with an experience of this quality, I would classify it as a ‘must-buy’ without hesitation. The graceful simplicity of the gameplay works superbly with the atmosphere of strange cathartic terror, thanks to the 1920s archive film-esque visuals and Lord of the Flies vibes. It’s difficult to find games with this level of thought, flawless game design and style in general, let alone on Xbox Live Arcade. I’ll end this review with an excellent quote from the review of John Teti of Eurgamer, because I couldn’t have put it more accurately: “[Limbo is] a game that has very few humans, but a surplus of humanity”. Outstanding info it is really. My mother has been awaiting with this info. Thanks for the helpful posting. It is also my opinion that mesothelioma has an incredibly long latency interval, which means that signs of the disease may not emerge until finally 30 to 50 years after the preliminary exposure to asbestos fiber. Pleural mesothelioma, which is the most common sort and has effects on the area about the lungs, may cause shortness of breath, torso pains, along with a persistent coughing, which may result in coughing up our blood.